Britain's GDP grew faster than any other of what the International Monetary Fund (IMF) calls "major advanced economies"—the other G7 economies—last year. That's according to the IMF's figures. These may actually understate the UK's lead, because the UK's GDP for 2014 was revised up to 2.8% yesterday from 2.6%. The IMF comparison is based on the 2.6% figure. Figures for other countries, such as Canada, have been revised and so differ from the IMF figures too. But these differences don't change the UK's ranking: even by the lower estimate of 2.6% the UK would come out on top. GDP growth for other large economies such as India and China is somewhat higher. 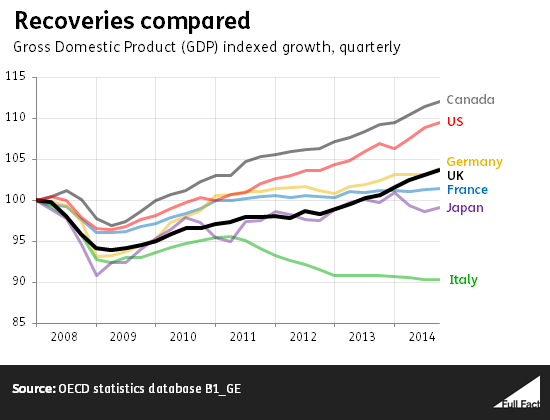 Their growth consistently outstrips those of 'advanced' economies but they're not generally considered comparable to the likes of the UK and Germany. The UK's recent growth comes after a period of slow recovery compared to other large nations and overall growth since the pre-recession peak is still behind that of some of the other major advanced economies.